Can I get heated seats? Do I have to get a sunroof? Find out what you need to know about Hyundai features right here. Proximity trunk or liftgate openerRelease latch by standing near the bumper for a few seconds. Release latch by standing near the bumper for a few seconds. Remote appCheck on car and remotely control various functions (remote start, locks, lights, and/or HVAC) from a telephone or computer. Usually requires a monthly fee, though often as part of a package of telematics services. Check on car and remotely control various functions (remote start, locks, lights, and/or HVAC) from a telephone or computer. Usually requires a monthly fee, though often as part of a package of telematics services. Remote start via appRemote start the car using a phone-based app. Complimentary for at least three years. Remote start the car using a phone-based app. Complimentary for at least three years. Vehicle health reportsPeriodically uploads and emails a vehicle diagnostic check. Periodically uploads and emails a vehicle diagnostic check. Android Auto supportRequires compatible Android phone. Apple CarPlay supportRequires compatible Apple iPhone. Ionizing air filtrationIonizes air to clean it. Might create high levels of ozone. Ionizes air to clean it. Might create high levels of ozone. Telematics service, such as OnStar, with navigationIn-vehicle security, communications, and diagnostics system plus turn-by-turn navigation (no map display). For 2011 and newer cars often includes a remote app. Monthly fee after the first 6-12 months. In-vehicle security, communications, and diagnostics system plus turn-by-turn navigation (no map display). For 2011 and newer cars often includes a remote app. Monthly fee after the first 6-12 months. Additional chrome trimOnly listed if not standard on all trims. No value because no way to compare across models. Body kitSide skirts and possibly a front air dam and rear apron. Side skirts and possibly a front air dam and rear apron. Bright-finished exhaust tip(s)Increasingly often these are not actually connected to the exhaust. Increasingly often these are not actually connected to the exhaust. Chrome grille (optional)Only listed if not standard on all trims. No value because no way to compare across models. Sport front fascia (optional)Only listed if not standard on all trims. No value because no way to compare across models. Sport rear fascia, e.g. diffuser (optional)Only listed if not standard on all trims. No value because no way to compare across models. CompassWe haven't given this feature a value because it's hard to tell which cars have it. We haven't given this feature a value because it's hard to tell which cars have it. Spotter mirror(s)Auxiliary convex lens in the corner of the outside mirror that improves view of the driver's blind spot. Auxiliary convex lens in the corner of the outside mirror that improves view of the driver's blind spot. Steering-linked headlightsHeadlights swivel when steering wheel is turned. Headlights swivel when steering wheel is turned. Upgraded instrumentsOnly listed if not standard on all trims. No value because no way to compare across models. Xenon HID headlightsProvide a brighter, whiter light than halogen headlights. Provide a brighter, whiter light than halogen headlights. Dark-colored headliner (optional)Only listed if not standard on all trims. No value because no way to compare across models. Performance steering system (optional)Only listed if not standard on all trims. No value because no way to compare across models. 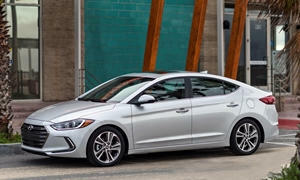 None of our members have yet commented on the available features of the 2019 Hyundai .